Professor Michael Nauenberg urged the public to consider the effects the removal of 80,000 volumes will have on students. Further, he claims that the university failed to adequately inform employees of the extent of the removal. Photo by Sean MacNaughton. More than 80,000 texts were permanently removed without faculty approval from the Science and Engineering (S&E) Library last summer to make room for renovated study space and a library cafe. 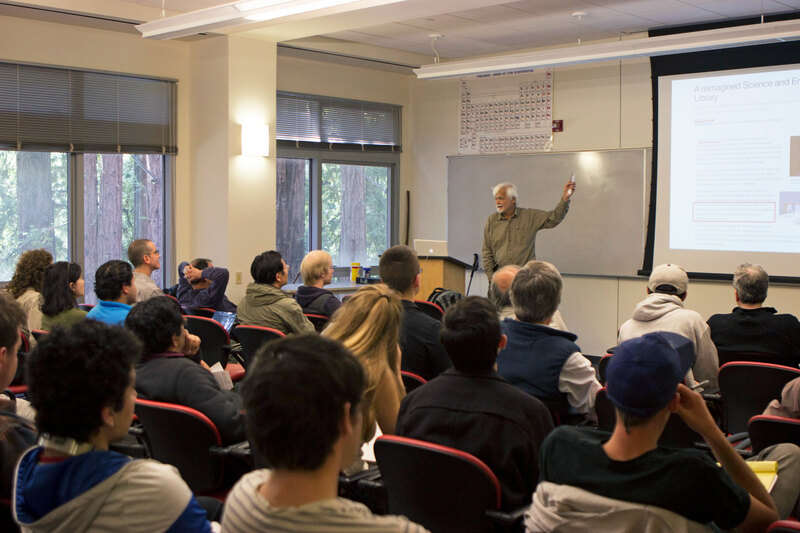 On April 13, research professor Michael Nauenberg, who has been a member of the UC Santa Cruz community for over 50 years, held a talk, urging students to consider how this may affect their education. The stacks of the first two floors of S&E Library have been consolidated into a much smaller collection located in the basement. The remaining stacks contain anything from issues of Vogue magazine to Martha Stewart’s biography. The library did not choose books to be kept by trends in content, but by whether or not they had been checked out in the last five years and if a copy existed at another UC campus. The removed books were either destroyed or relocated to other storage facilities, but electronic copies that existed prior to consolidation are still accessible online, said interim Executive Vice Chancellor Herbie Lee. Additionally, copies of removed books are still available via interlibrary loan from other UC campuses. In the volumes’ absence, large open spaces and scattered study tables are placeholders for further construction and forthcoming changes to the library, Lee said. The design for re-envisioned S&E Library, while still in the earliest stages of planning, includes a space for both quiet and collaborative study as well as a new cafe on the basement level. Lee said he believes a diminished print collection is actually a step toward the future, in which institutions are focusing on online collections as opposed to print. “[In the fields of engineering and science] the crucial materials are all moving online. When I think of the library, I think of online access,” Lee said. What is happening at UCSC reflects a national trend, Lee said. On April 7, the Pew Research Center found public library usage has decreased but online access and resources have increased. Institutions like UCSC are reevaluating the purpose and function of libraries, Lee said. Research professor Michael Nauenberg said the administration failed to adequately communicate the drastic changes to the library collection. While the administration did inform faculty the collection would be consolidated, Nauenberg said there was miscommunication and that the faculty did not understand the project’s gravity. The administration, however, sees the issue as a problem of miscommunication. Lee said the library attempted to consult the faculty. Steven Mazliach, a fourth-year computer science student who attended Nauenberg’s talk, said the demolition of the S&E collection pinpoints communication issues between administration and the student body. One of Nauenberg’s goals was not only to raise awareness of the issue, but to call the students to action in the face of what he views as a persistent disconnect between the administration and the rest of the university.